Castlecliff Club Mustangs victorious over Mustangs Black in battle for WSA Reserve Cup on Saturday. 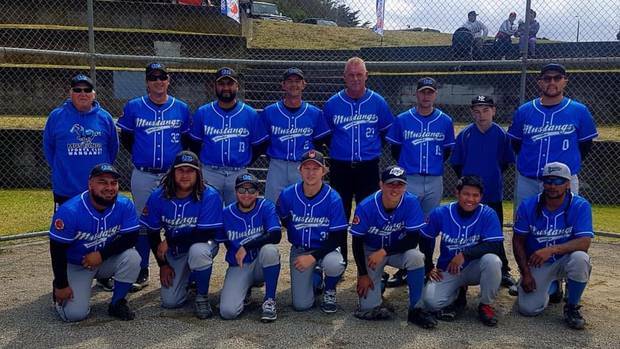 In an in-house Castlecliff Club Mustangs battle two teams went to war for bragging rights and the Wanganui Softball Association Reserve Cup on Saturday. Mustangs Black, fresh from their Manawatu competition victory the previous weekend, succumbed to the older, more experienced players in the Mustangs 5-3. Both teams were scoreless in their first turn at bat. The black team were retired without scoring in their second turn at bat, but then Castlecliff Mustangs put bat to ball. Trent Hemi hit safely, followed by hits from Danny Green and Matt Ranga, and with a couple of wayward throws and a perfect bunt by Lenox Folds, three runs were scored. The Black team were next to score when Marama Savage picked up a walk, stole two bases and scored on a hit by Johnny Kiwara. Castlecliff Mustangs added two more runs during their next bat, when Ben Hollis hit to the outfield for a two base hit. Hemi then hit deep to centrefield where a diving catch was spilled by the fielder and both runners scored to give Mustangs a 5-1 lead. In the 7th innings the Black team came out firing. Youngsters Kevin Rennie and Devon Maihi both hit safely with one and two base hits with Rennie scoring off the Maihi hit. Maihi was scored by sacrifice hit from Savage. Pitching for Black Maihi faced 26 batters taking out 9 at the plate, while giving up 8 hits. Green for Mustangs faced 28 batters took 11 strikeouts and conceded 5 hits. Congratulations must go to The Castlecliff Club Mustangs Black team , Who took out their section of the Manawatu competition last weekend with a solid 7-0 win over Bromac Bombers. "This was an amazing effort from this young side who are performing very well under the coaching of Shaun Pirere," head club coach Ron Hollis said. 'Shaun's done a fantastic job with these boys. With a lot of players coming from a slowpitch competition last season to having both teams now in the top section of the Manawatu reserve grade next season is a real achievement for our boys. "Mustangs will be entering a women's team next season so anyone wanting to play are most welcome. Thank you to all our supporters who travelled every week to cheer us on," Hollis said.